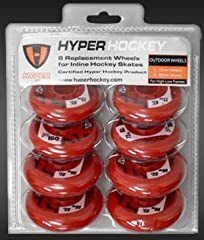 Hockey Hilo Replacement pack includes 8 wheels (4-72mm & 4-80mm). The Pro 150 defines the true meaning of outdoor roller hockey: Grippy, aggressive, and able to take abuse. Made specifically for the outdoor rink– it blows away any competition with a superior combination of hockey specific technologies. Two-times longer lasting that any other outdoor wheel on the market today.